The perfectly round disk is spinning counter-clockwise at about the pace of a brisk walk, according to locals. In the city of Westbrook, Maine - just a 20-minute drive east of Portland - a near-perfect disk of ice has formed in the Presumpscot River. "It's probably formed - and this is speculation - by the aggregation of small little bits of ice or in an initial big chunk of ice that, because of initial rotation, little pieces of ice glob onto it", Nakroshis said. "... allowing the water to freeze more readily, while water moves faster around the edges, generating the spin". The alien-looking disk was first spotted Monday morning. 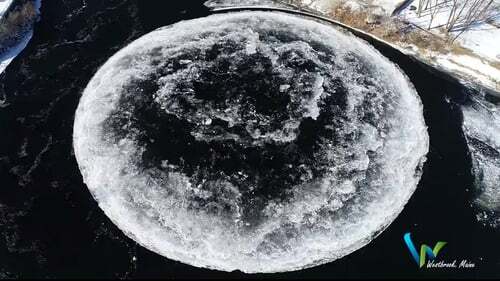 "I have not personally [seen an ice disk like this], but these are seen occasionally in the right conditions, usually at a bend in a river where eddies are common", Walt Meier, senior research scientist at the National Snow and Ice Data Center, told Live Science.